A sense of resignation is writ large on the face of Balwinder Kaur as she holds photograph of her son Manjit Singh, who was hanged to death by terrorists in 1990. Manjit was newly engaged when he and his friend were picked up from a petrol station. The terrorists belonged to the Resham Singh gang. Even after approval from the Punjab Council of Ministers to give jobs on compassionate grounds to next of kin of the employees who had died in harness, the authorities concerned have been delaying the process to give appointments to such persons. Extending full support to the Shiromani Akali Dal (SAD), the Shiromani Gurdwara Prabandhak Committee (SGPC) chief, Mr Gurcharan Singh Tohra, today stated that the party would sweep the coming Lok Sabha elections in Punjab by winning all 13 seats. SGPC secretary Manjit Singh Calcutta has urged the French President to withdraw legislation banning wearing of turban by Sikhs. The secretary said that in the case of Sikhs, turban is unique compared to other religions. A five-member panel constituted by Akal Takht has recommended the revocation of the suspension of 284 members of the Chief Khalsa Diwan (CKD), giving a twist to the dispute between the two warring groups in the oldest Sikh institution. A former Jathedar of Akal Takht, Bhai Ranjit Singh, today floated Akal Council, which would contest the forthcoming general elections of the Shiromani Gurdwara Parbandhak Committee (SGPC) against the candidates of the Shiromani Akali Dal, headed by Mr Parkash Singh Badal. ALONG THE ZERO LINE (Ferozepore): The BSF authorities here are facing a tough resistance, not from the enemy on the other side of the fence, but also from their own people, who are protesting against the frequent and stringent frisking of the farmers going across the cobra-fencing to work in their fields. 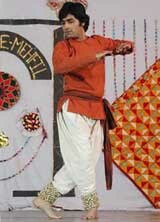 Kathak dancer Adnan Jahangir from Pakistan performs at Shaam-e-Mehfil at Khalsa College for Women in Amritsar on Saturday. Ferozepore: While members of the Punjabi delegation led by the Punjab Chief Minister Capt Amarinder Singh, are feeling ecstatic over the success of their visit to Lahore, scores of innocent Punjabi youths lodged in various jails of Pakistan are feeling let down as no one has bothered to make any effort to secure their release and save them from the ordeal they are undergoing at the hands of Pakistani jail authorities. Mrs Chandravati, a former Governor of Goa and central observer of the Congress arrived here on Friday evening to assess the names of the prospective candidates to contest the Lok Sabha elections from the Faridkot parliamentary constituency. She held individual meetings with senior Congress leaders and workers for more than two hours to have their views on the nomination of party candidate from the Faridkot constituency. A BJP stalwart, Mr Balramji Dass Tandon, and Mr Daya Singh Sodhi, a former minister and former state BJP president, today decided to bury the hatchet and resolved to work in tandem during the forthcoming Lok Sabha elections. Mr Tandon went to the house of Mr Sodhi and both had a closed-door meeting over breakfast. The BSP president, Ms Mayawati, today rejected the party list of candidates, from Punjab. “Ms Mayawati has rejected the candidature of Mr Maan Singh Manhera from Ropar and Mr Pawan Kumar Tinoo from Phillaur Lok Sabha seats, the BSP in change of Punjab, Mr Narinder Kashyap, said in a statement today. Ruling out the resignation of the Deputy Chief Minister, Ms Rajinder Kaur Bhattal, the Punjab Congress Chief, Mr H.S. Hanspal, today reiterated that the party would provide full legal and moral support to her in the alleged embezzlement case. A seminar held here today stressed upon the need to set up boards and other regulatory bodies to solve the debt crisis and regulate the working of private moneylenders to check the exploitation of farmers. The PSEB Engineers Association has strongly opposed a proposal of the board to entrust the execution of Lehra Mohabat Stage-2 on Engineering Procurement and Constitution (EPC) basis to BHEL. The association said it would escalate the project cost by at least Rs 200 crore. The Punjab Government is drawing up an ambitious project with an outlay of Rs 550 crore for which it will seek World Bank funds to improve the medical and health services in the rural sector. This was stated by the Director Health Services and Family Welfare, Dr G.L. Goel, while talking to newspersons after the inauguration of Health Fair-2004 here today. Eyebrows are being raised over the hospitalisation of Dr Laxmi Garg, who was arrested yesterday for her involvement in an illegal abortion and for subsequently dumping the foetus in garbage, at Guru Gobind Singh Medical College and Hospital, Faridkot where the foetus has been sent for forensic examination. Every third tuberculosis (TB) patient in the world is an Indian and the country has 15 million TB patients. This was stated by Dr Surinder Singla, a TB and chest diseases specialist and medical officer in-charge, District TB Control (MO-DTC), Sangrur, while addressing a TB awareness camp, organised at Cheema village, near Sunam on Thursday. The local municipal council has recently passed a resolution 156 declaring about 2 acre in the Sharma store area of Nangal as an unbuilt area. The case on the plea of owner of the land was being sent to the Director, Local Government, for taking the area under the town planning scheme. Akali Dal (Amritsar) President Simranjit Singh Mann, in a letter to Deputy Prime Minister L.K. Advani, has demanded presidential reprieve to all Sikh prisoners, whether convicted or under trial, without ascertaining the gravity of their alleged crimes and applying the same principle as was applied in case of Mr Peter Bleach, a foreigner. The Deputy Chief Minister of Jammu and Kashmir, Mr Mangat Ram Sharma, today said that cross-border infiltration in the valley was still on and terrorist training camps in Pakistan Occupied Kashmir were intact. The Punjab Brahmin Sabha has opposed the 85th amendment and urged the Chief Minister not to implement it till the Supreme Court decides on it. A resolution in this regard was passed unanimously at a state-level meeting of the sabha held at Sirhind city today. Ten Pakistan poets arrived here via the Wagah land route to participate in a kavi darbar to be held in New Delhi on February 15. Talking to mediapersons here, the leader of the delegation, Mr Azas-Ul-Naz said famous poets, singers, artists, quawals from both India and Pakistan would perform at the mushaira. The idea was to present the common culture of both nations, he added. The Punjab government will provide bulk milk coolers at a cost of Rs 3 crore to milk cooperative societies with the aim of ensuring bacteria-free supply of the commodity. State Finance Minister Lal Singh today initiated repair work from the Patiala-Pohewa road to Lelena village. Speaking on the occasion, Mr Lal Singh said the repair work of the road would be completed before April 13. He said nearly Rs 16.50 lakh would be spent for the renovation work. After years of wait, 30 houses in the newly built Punjab Police Housing Corporation (PPHC) Colony in Sector 68 were allotted to policemen serving in Ropar. The Senior Superintendent of Police (SSP) Ropar, Mr S.P. Singh, allotted the houses at a special ceremony conducted for the draw of lots today. Although dhaba owner Surinder Kumar offers his customers with mouth-watering dishes, he prefers to eat iron himself. The 48-year-old Amritsar resident has been eating nut-bolts, pins, iron nails, rivets and zip locks for the past three years. The Federation of Arhtia Association, Punjab has demanded an increase in the commission on left-out agricultural produce and the abolition of market fee on petty agricultural produces. A memorandum in this regard was submitted to the Chief Minister, Capt Amarinder Singh, recently. A quarterly Lok Adalat was held in the Sessions Court complex here yesterday, in which 53 cases relating to motor accident claims, matrimonial, civil suits, executions and criminal were taken up. As many as 31 cases were disposed of and a sum of Rs 1,61,800 was settled. As many as 2,080 traffic challans were settled while more than Rs 1.6 lakh was recovered as fine during a special lok adalat held at district courts complex here today. The police has solved the murder of 36-year-old Neetu, which took place in the city on February 4, with the arrest of two brothers. Neetu, mother of two girls and wife of a bank employee, Mr Mohan Lal, was found murdered by her husband when he came home from the bank. Mr Kapil Dev, SSP, at a press conference here today, said Devinder Singh, alias Deepu, and Surinder Singh, who were the victim’s family friends, committed the murder in a filmy style. A Scheduled Caste school going girl of village Harrangpura of this district was allegedly raped by another Scheduled Caste resident of the same village today afternoon. 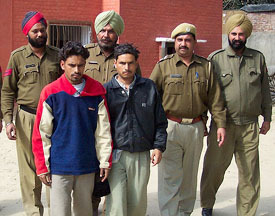 The district police has arrested Sukhpreet Kaur and her husband Ravinder Singh, a resident of Badinpur in the district working as a travel agent, allegedly for misguiding the police by enacting a drama of fake kidnapping just to get their customers, who had been demanding the money they had given them for going abroad, booked. The police has registered a case under Sections 420 and 120B of the IPC against four persons. LUDHIANA: The Indian Council of Agricultural Research (ICAR) has asked all state agricultural universities to enhance the age of retirement of the teachers from 60 to 62 years. This order is effective from October 31, 2003. On the second day of seventh Punjab Science Congress more than 50 research papers were presented and young scientist competitions were held for the Young Scientist Award to be presented on February 9 at Guru Nanak Dev University here today. The convention is being held by the Human Genetics Department of Guru Nanak Dev University. As many as 160 students received graduation degrees at the convocation held at Guru Nanak College here today. Dr S.P. Singh, Vice-Chancellor of Guru Nanak Dev University, Amritsar, was the chief guest while Punjabi writer Prof Piara Singh Bhogal was the guest of honour. The Minister of State for Education Punjab, Prof Darbari Lal, here today stated that the Punjab Government had prepared a project for imparting computer education to students in government schools to enable them to measure up to the new age hi-tech requirements of the job market at home and abroad. A resident of Mundi Kharar has complained to the SDM that a local school is not allowing his two children to attend classes without assigning any reason. Mr Harcharan Singh complained in writing that his daughter was studying in Class VII and his son in Class IX at APJ Public School.